I never cared much about Valentine’s Day, and honestly I never do anything special this day. I think that we should show affection towards others, and get out and enjoy the company of someone else whenever we want, and not on a given day that society dictates, so I didn’t prepare anything special for the blog either. But I do have a review that I would like to share with you, and if you feel the same way I do, maybe this book will be your company for Valentine’s Day. 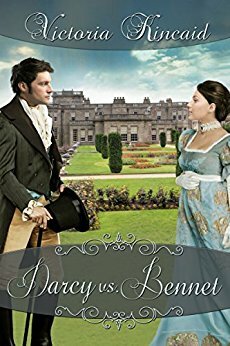 When Darcy vs. Bennet came out last year, everyone was talking about it, and I heard that it was a love at first sight story. I’m usually not very fond of the love at first sight premise, for the simple reason that I don’t believe in it, so I was a little put out because I love Victoria Kincaid’s books and I was eager to read this one. But it was a Victoria Kincaid book nonetheless, so I had to read it! I filled myself with courage and gave it a go. Guess what? I should have read it the first time I got a chance because it was absolutely wonderful!!! In Darcy vs. Bennet Mr. Darcy meets Elizabeth Bennet at a masquerade ball, and even if they feel drawn to each other almost immediately, they do have a chance to dance, talk and get to know each other a little better. It is also in this masquerade ball that Elizabeth proves to be a trustworthy friend in the eyes of Mr. Darcy, by saving Georgiana from eloping with Mr. Wickham. But when she hears Mr. Darcy’s family name, she understands a relationship between them can never occur due to their parents’ feud and flees the party. Mr. Darcy cannot forget the only woman who had thus far captured his attention and searches everywhere for Elizabeth, but knowing only her given name is endeavor is unsuccessful. Two years later, when he travels to Netherfield with Mr. Bingley, he reunites with Elizabeth and from the moment they recognize each other we are faced with a turbulent but poignant love story! In this book Mr. Darcy senior is still alive and he is the true villain of the story, he is a despicable man and I loved to hate him in Darcy vs. Bennet. In fact, I believe he became my favorite villain in a JAFF story because it was due to his unrelenting demands that Mr. Darcy takes one of the bravest decisions he was ever asked to make on behalf of his love for Elizabeth. I loved how strong and unbinding Darcy and Elizabeth’s love was in this book, and how far Mr. Darcy would go to be with her; how she made him a humbler man in a completely different way than we are used to see and how they suffered for their love. If I go straight to the point, I just LOVED this book! In Darcy vs. Bennet I could feel once more the type of love Mrs. Kincaid developed in The Secrets of Darcy and Elizabeth: intense, secretive, intimate, insecure and resolute at the same time. It is a fast paced book that captured my heart from page one until the end. I’ve read many of Victoria Kincaid’s books, if not all, and I know she is a diversified author. Among her works, one can either find a humorous and light book or a gripping romance that will touch our souls. Darcy vs Bennet is amongst the second category. It is an epic romance that I recommend to everyone. Thanks for a lovely review of a really great book, Rita. This is one of my favourites of Victoria’s books. I’ve read all of them and simply love the variety in her writing. From the high farce of Chaos Comes to Longbourn to the drama of this one, and everything inbetween. Like you, I really loathed Darcy Senior. Sometimes, it’s so satisfying to have a totally nasty villain to hate! I loved this one, too. I thought it was creative and heartwarming. Nice review, Rita! Thank you Sophia 🙂 I shouldn’t have taken this long to read it should I? Lovely review, Rita! I have this one on my wishlist still to buy but it will happen this year! Great review!!! I’ve read this book and agree that Mr Darcy Senior was indeed,a horrible,disgruntled and highly disagreeable man!! Loved the huge sacrifice that our beloved Mr D was willing to make, all for the sake of a lifetime of happiness with Elizabeth!!! What a man!!! Love Victoria’s stories! She has a lovely way with words! Great review! I loved this book, and I’m a huge fan of Victoria’s writing. Lovely review, good book, read it and reviewed it also. Mr. Darcy, the father, was truly a bad guy in this book.